You see no one can be perfect, and Nnamdi Kanu is no exception. As much as I love him as a person, and admire the great work he has done in building Radio Biafra, and IPOB, there are many things I am not sure of, and even things I dislike. To say I follow him blindly is a big lie, but there is a reason why I will support everything Nnamdi Kanu and IPOB do, because in the long run I really have little choice in the matter. Let me explain. Let us assume that Nnamdi Kanu is a goat. A very courageous goat but like a goat, not very intelligent, I will still follow him. The reason is simple. For all the other brilliant people I see, none, and I mean none, has the courage to inspire millions of Igbos and non-Igbos to stand up to the Hausa – Fulani Islamist Jihadist hegemony that has befallen the country today. You see there are some things I do not like about Nnamdi Kanu and there are some decisions that I disagree with, but I do not assume that I am more intelligent than the whole of IPOB that made that decision. After all, in democracy, for it to work, the minority always disagrees with the majority, but the minority must suspend their own beliefs and key in with the majority. There are people that have a wrong-headed sense of themselves as superior. People like Charlie Boy, Jim Iyke, Mbe Nwaniga, Kelechi Deca, Joe Igbokwe, the elders of Ohaneze and the Governors of the South-East States. You see they do not have the guts to defend their people, and yet they disparage the only person who has the guts. Some think they have guts until Hausa Fulani chase them out of Wuse Market. Some, like Mbe Nwaniga and Kelechi Deca are really very nice people, but who have wrong-headed idealistic notions that refuse to appreciate the violent underbelly and irreconcilable ideologies that make Nigeria impossible. So even if Nnamdi Kanu is just a courageous goat, with no good sense of reasoning, all we should do is for all those brilliant people to surround Nnamdi Kanu, the courageous but not very intelligent goat, to take the bullets for them and we all still forge forward. Look at how silly Charlie Boy looked racing away from Wuse Market. Compare it with how formidable Nnamdi looked when he stepped out of his vehicle and walked towards the Ebonyi Police checkpoint, with thousands behind him. The police barrier melted as they reversed their vehicles out of the way. Was it just spiritual force? Or did they, the police know or fear that if they tried pim, they will hear nwiiii? Now imagine Charlie Boy and Jim Iyke walking side by side with Nnamdi facing another checkpoint with a multitude of diehard IPOB peaceful warriors, standing resolutely behind them. Imagine if Ohaneze elders have the guts to join Nnamdi in the march. Then, imagine any of the cowardly Governors rolling out a red carpet for Nnamdi and shouting at the top of his voice, “Nigeria, this is our son, in whom we are well pleased.” Imagine if Pat Utomi brought his cerebral mind behind IPOB. Imagine! Imagine! Nnamdi is only a battering ram for Igbos and non-Igbos that want to flee Nigeria. He needs social economic planners for the new Biafra. Gather around him. Fill up the empty spaces with good plans. You cannot do what he is doing to shake the pillars of the Status Quo, but it is still better for you to join than stand apart and scoff. Imagine how powerful our unity would become. Unfortunately, their egos are so far refusing to allow them, as they mock that small boy with his ‘miscreants’ like me. In their great learning, their foolishness would not let them see a picture bigger than themselves. But let us assume that Nnamdi Kanu was even less intelligent than a goat, but still had all this courage and spiritual force; and let us even accept that he may even fail. I will still follow him and struggle with him to succeed, simply because there is no one else out there willing to stand up with spiritual force, without violence, to bring down the walls of Jericho. Charlie Boy tried and ran. Who else biko. I see the gentle, soft spoken unassuming man, that carries no airs, but when he speaks with power, he thunders like a lion, a tiger whose roar sends shivers to all those who hate truth. I see a man of courage who fears no one. Who tells the truth and calls the enemy of the people what they are. And then people say he is abusing, they call it hate speech, when what he has done is give a perfect description of evil. If you describe the evil in someone, it is NOT an abuse. It is simply a description. Nnamdi Kanu does not abuse. He honestly describes. Some people say that he is like Hitler and will soon bring violence. They say that this is how Boko Haram started. No! I do not see that at all. They point at his recent Biafra Security Services and exclaim he is armed. Yet, BSS is an unarmed group, that has been set up to protect us from the extreme hate groups of Fulani Herdsmen because we are surrounded by a Fulani-led Army and Police that seem to be complicit in our mass murder. What I see in Nnamdi Kanu is a Gandhi, Martin Luther King or Mandela. And even if he was a Hitler in the making, in so far as there is no alternative, then I will follow him, and if he proves to be a Hitler, we will deal with him like the World dealt with Hitler. But even if he was Hitler, what is really the difference between being ruled by a Jihadist Demon and a Nazi Devil? I will certainly take a chance, and hope he is an angel rather than a devil, than remain yoked to a known demon. Yes, there are many reasons why I think I know better than IPOB, just like many Facebook Vuvuzelas, who with their 200 likes and comments think they are champions of social media and qualify to tell Nnamdi what to do. There are some of the IPOB decisions which I think is just crazy. But you know what? They are in good company. When Gandhi, the father of Indian Independence, told his fellow campaigners that they will bear no arms in fighting the British Raj, they all thought he was mad. So, during one demonstration the British army blocked their path. There were thousands of them. They simply stood at attention. And one at a time they will walk up to the army who would clobber the person. As one fell, another walked forward without fear. After some days, the trigger happy British soldiers, not having the joy of killing Indian coolies, got tired of clobbering innocents that filled up their prisons. The World watched as these brutal soldiers beat up defenceless civilians who offered no resistance. Eventually, out of shame, the soldiers gave up and gave way. Gandhi’s victory made world-wide headlines. The people stood in awe of Gandhi. That was what Nnamdi did at the police checkpoint in Ebonyi State. I urge you all to try and watch the film Gandhi, so you can understand the genius behind the method of Civil Disobedience. As Gandhi defeated the British Raj morally, the people lined up behind him. What mattered most was their Unity. Reverend Martin Luther King did even more stupid things. A black guy was forced out of a restaurant for whites only. So, Martin Luther King organised a long line of thousands of blacks who waited patiently in queues that went around the block. Each one will enter and go and sit and request to be served. That one will be beaten and the police would pick the person up. The World was watching. Then as soon as one goes down, another follows. The local jail got filled with hundreds of blacks. People avoided the restaurant. Eventually the owner gave up and started serving the blacks. Other restaurants wised up as similar actions spread nationwide and that ended whites-only restaurants in the USA. As Reverend King defeated the White Supremacists morally, the people lined up behind him. What mattered most was their Unity. Think of the stupid Mandela. The silly goat had an option to renounce violence and have a reduced sentence. Now his case was that of pretence violence, for they only blew up installations and always warned people out of the way. In the end, their violence was all mouth. For all practical purposes, Mandela and ANC were non-violent. To ordinary people like me, who thought we knew better, these masters of Civil Disobedience protests, Gandhi, King and Mandela, took decisions we thought only a goat could think of, but which turned out to be master strokes of genius. As Mandela defeated apartheid morally, the people lined up behind him. What mattered most was their Unity. There are many who are scattering our unity because they believe the Nigerian Press such as Channels TV, Internet sites and many Newpapers such as Nation, Punch and even the Sun that belongs to one of our sons, the disappointing, Orji Uzor Kalu. They mess up the minds of both Nigerians and Biafrans. Some think IPOB is a cult of personality and dictatorial. I laugh. Was Gandhi, Martin Luther King and Mandela, not cults of personality and dictatorial? Did it stop them from achieving objectives? It WAS actually necessary because Independence movements and freedom fighting do not succeed as democracies. For those who say he is being worshiped, was Gandhi not worshipped? He was venerated in his life time by the superstitious, and was even thought of as a god in polytheistic India. For those who say he is called Supreme Leader was Gandhi not an absolute Supreme Leader? Nyerere was called Mwalimu, the great teacher. Mandela was called Madiba, the Great Leader. They all had absolute authority. Whatever they said was carried out immediately, not because they ordered, but because the people loved them so much they just wanted to do what would make them happy. Did we not once honour Zik that way with Zik of Africa? Have we not worshipped Ojukwu more, driven by an intense sense of gratitude? Nnamdi Kanu is like that. Did he not accept these praises and move on with his great work of liberation? That Nnamdi is worshipped by a superstitious few does not mean Nnamdi thinks its true, but like Gandhi he just lets them be and focuses on his objective? However, although he is called Supreme Leader, decisions in IPOB are democratic and collegiate amongst its leaders with widespread consultation. Leadership of an Independence struggle for Freedom is hardly ever by democracy. It is usually by leaders who feel compelled in spirit, called upon to bring freedom to their people. The same is true for all struggles for Freedom. Can you imagine Gandhi, Martin Luther King or Mandela being removed by democratic vote from their struggle? The dangers of electing the wrong person in such struggles is too high and would destroy the struggle. Gandhi, Martin Luther King and Mandela were leaders whose words were law, because the people wanted it so, yet they were such strong leaders they never abused it, always taking decisions with their leadership through wise and wide consultation. Nnamdi Kanu is like that. Yet, there are still many of us who think they know better out of sheer ignorance about the Civil Disobedience method, but they will not accept they are ignorant. A very good example include those who cannot understand that completely boycotting Anambra elections is a master stroke of Civil Disobedience genius. I urge you all to read about Gandhi and Reverend King and Civil Disobedience, so Nnamdi Kanu can stop appearing weird to you. Let me use myself as an example. I disagreed with Anambra State election boycott initially. Like most ordinary people, I thought it was best for IPOB to field candidates to win. However, I was committed to submitting myself to IPOB unity because UNITY IS SUPREME. I did not want to be one of those who do not have the discipline to subsume their preferences to the greater body fighting for Biafra independence. This led me to start thinking of why Kanu and IPOB should do such a crazy thing. The proof of the pudding is in the eating. When we all did the sit at home on Memorial Day, it’s impact was really shocking. Imagine such a thing on election day. Its power will be earth quaking throughout Nigeria and the international community. But if we see lots of people at the voting booth it will do damage to the image of IPOB. However, the bigger damage would be for IPOB to use its power to contest elections and get rigged out by INEC, because they will NEVER allow IPOB people to win elections. However, because I was committed to the principle of formidable UNITY, I finally opened my eyes and saw the brilliance of the IPOB boycott. Our target now is to make it as near to total as possible. A Governor would still be elected, as some people would still vote, but empty polling booths will tell a devastating tale. Obiano would probably be returned to power, but he is neither worse nor better than the APC or PDP candidate. Who wins is irrelevant for Biafra. It is how big, the boycott, that matters. I also do not mind Nnamdi being called Supreme Leader. It makes people think of Megalomania. However, many of the members of IPOB feel they need to accord him that. Afterall, members of Churches call their pastors, mamas and papas and all kinds of ‘megalomaniac’ names. Its built into the Nigerian DNA it seems. Russell Bluejack went before Nnamdi Kanu and fell on his knees. He said he felt compelled, even though Nnamdi resisted it. I do not like the way some people seem to worship him without condemnation or open rebuke from him. But the truth is that in a superstitious society, people are bound to convert extraordinary achievers into demigods. Zik in his hey days was once a god. He was said to have such powers that he locked up the mammywater of River Niger in a bottle. We were so superstitious as children, WE BELIEVED IT! We worshipped him. Gandhi was worshipped too. He found it amusing but he let them be because he understood their need to bow before him. I can only hope that Nnamdi is like Gandhi. I do not like all this Jewish business in Biafra. It confuses and makes Christians think its blasphemy against Christ and losing us support even amongst our own people. I believe that religion should be a private matter. I think that the idea of Igbos being ethnic Jews is farfetched but nothing wrong with being a converted Jew. However, I do think that a large number of Jews, fleeing persecution, settled in Igbo land and we borrowed many of the cultures they brought, including democracy, priest-kings, circumcision and seven-year apprenticeship in trade. This probably means some Igbos have Jewish DNA in them. The most important thing is that most religions are pure superstition. Catholics think that Mary is the Mother of God, an idea that protestants find blasphemous. However, if you tell a Christian that they turned a man to God they will reject you. But we do know that Rastafarians did turn a man, Emperor Haille Selassie of Ethipoia, into God. Given that all religions have their myths or weirdness, I am not bothered about the religion of Nnamdi Kanu and those who want to follow him into the Jewish faith. They could be Hindus or Buddhists for all I care. Any religion, except for Jihadists in Islam, are welcome. So, having spewed all my negatives about Nnamdi, what is my overall assessment of him? Like I said, even if Nnamdi was a goat, with such resolute courage, I will still follow him, because there is no other alternative in a sea of Efulefu leaders and fearful elders, willing to sell our birthrights even to the lowest bidder. However, I have news for you. Nnamdi Kanu, is no goat. His negatives are insignificant compared to his outstanding positives. He is one of the most cerebral, most courageous, most considerate men I know. He is an extraordinary leader, manager, administrator and mobiliser of men and resources. If you doubt me, go and set up your own world-wide radio and TV and get millions of people to follow you. Do not think I have always felt like that. The first time I heard him on Radio, I was repelled by his caustic tongue, as he called politicians what they were without mincing words. Why should we mince words when we want to call a mass murderer or a thief by what they do? Such people should be blamed, shamed and tamed. I slowly came to realise that Kanu was not abusing but describing these people exactly as they are. 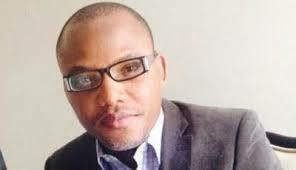 I also came to realise, after forcing myself to listen to Radio Biafra, that Kanu is sacrificial, honest and loving. A powerful spiritual force emanates from him to dominate all those who come under the influence of his aura. I am glad and relieved to have such a man as Igbo leader and that is why I line up behind him. O yes, undoubtedly, Nnamdi Kanu is fallible as a human being and with the IPOB leadership can make mistakes, but let us close ranks and keep our mistakes in-house rather than blabbing it publicly. Take for instance, the Anambra State election boycott, if it is a mistake, the fact that we would all boycott together would still be powerful and awesome, and send the unmistakable global message that Igbos want out of Nigeria. However, if we went into elections and we fail, it will seriously dent the reputation of IPOB, which is not in our interest at all. At this very point in our history, it is better for the Anambra Governorship elections to crash than for IPOBs reputation for formidability to be dented. Anambra can be temporarily sacrificed today for our glory tomorrow as one of the modern industrial nations of the world, from which Anambra is poised to benefit the most. The message is simple. For us to succeed we must be UNITED. To be UNITED we must carry the good news not only to the grass roots, but also to the Efulefus and fearful elders. We must persuade even our Governors and elders to accept Nnamdi Kanu as an extraordinary leader of the Igbos, who is fighting for freedom for both Igbos and non-Igbos. We must persuade, not just abuse. Let us all unite and pursue one course. If we boycott, let us all boycott. If we make mistakes let all of us make that mistake, and even in that, doing it together will show a united front. The more united we are, the stronger and more formidable we are. As Nnamdi Kanu and IPOB defeat Nigeria morally, the people will line up behind him. What matters most is our Unity. That died to break our fetters. I HAVE WRITTEN THIS ARTICLE SO THAT THOSE WHO BELIEVE IN BIAFRA CAN USE IT TO PERSUADE THOSE WHO DOUBT. STORE THIS ARTICLE, AND SEND IT TO THOSE WHO DOUBT. ALTHOUGH IT IS LONG, ENCOURAGE THEM TO FINISH IT. SHARE, SO OTHERS CAN UNDERSTAND THAT WHAT EACH THINKS IS LESS IMPORTANT THAN ONE FORMIDABLE FRONT.